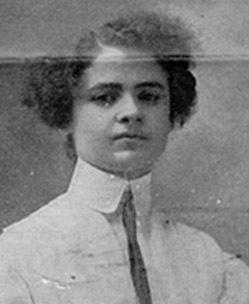 In the early 1900s, Clara Lemlich’s life resembled that of thousands of other immigrant girls. Born in the Ukraine in 1886, she came to New York with her family in 1903. Still a teenager and barely five feet tall, she toiled at a job as a draper in a waist factory. Strikes were frequent, and Lemlich didn’t shy away from the picket line. “However every strike we called was broken by the police and gangsters hired by the bosses,” she wrote. From 1906 to 1909, Lemlich was arrested more than 17 times and was beaten up by hired thugs who broke her ribs and tried to intimidate her. Their tactics didn’t work. “Infuriated by working conditions that, she said, reduced human beings to the status of machines, she began organizing women into the fledgling International Ladies Garment Workers Union (ILGWU) soon after her arrival,” stated the Jewish Women’s Archive. Lemlich’s bravest hour, however, came in November 1909. 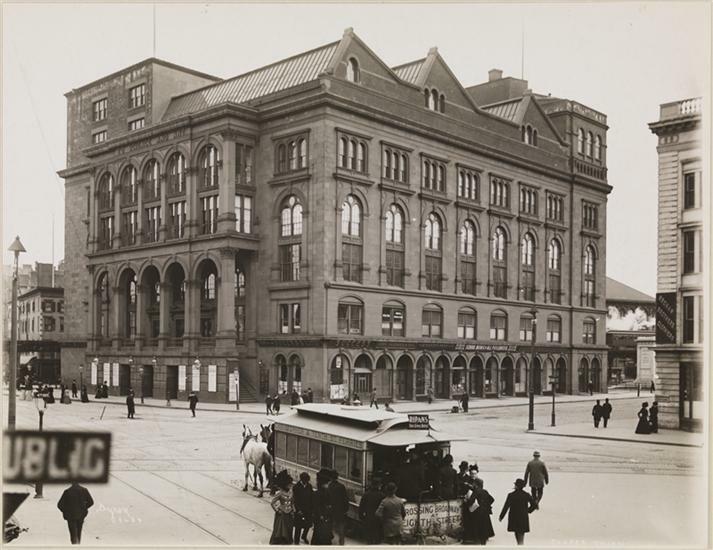 A meeting was being held at Cooper Union (left, in 1899) to determine whether sweatshop workers citywide should go on strike. Defying older male union leaders, she rose to the podium. “I am one of those who suffers from the abuses described here, and I move that we go on a general strike,” she told the crowd in Yiddish. 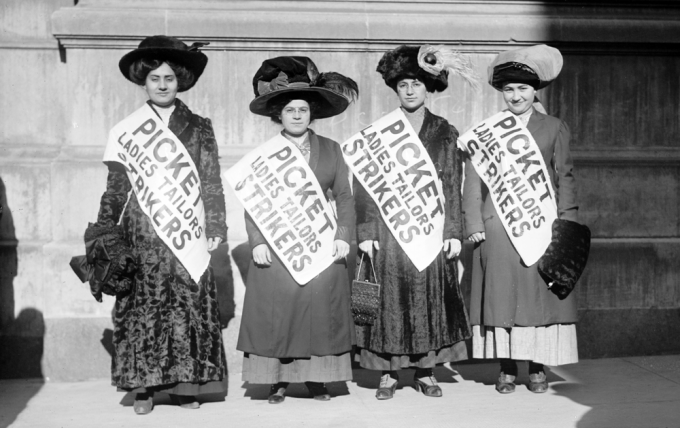 Whatever she said exactly, her words helped galvanize support for a strike that began in late November 1909. 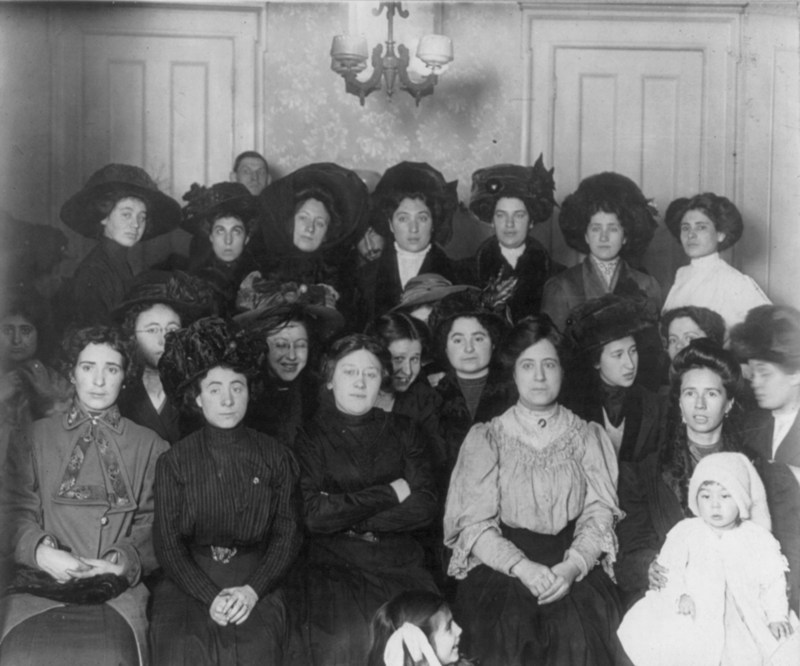 “Between 30,000 and 40,000 young women garment workers—predominantly Jewish immigrants (some pictured at left)—walked off their jobs over the next few weeks,” explained the Jewish Women’s Archive. Dubbed the Uprising of the 20,000, the strike made newspaper headlines; workers who were arrested had their bail paid for by wealthy women (like Anne Morgan, below, daughter of J.P. Morgan) who supported their efforts. 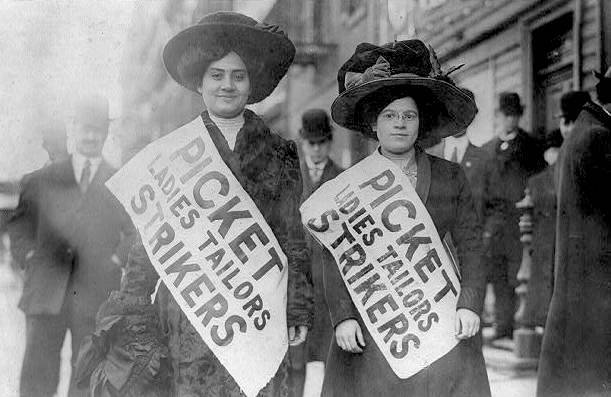 By February 1910, the strike was over. Most of the sweatshops agreed some of their demands for better pay, improved work conditions, and shorter hours. One that didn’t was the Triangle Waist Company—where a little more than a year later in March 1911, 146 workers perished in a fire at the Greene Street factory. The Triangle fire was a turning point in New York, helping to create laws to guarantee safer factories and more fair wages. It was a turning point for Lemlich as well. 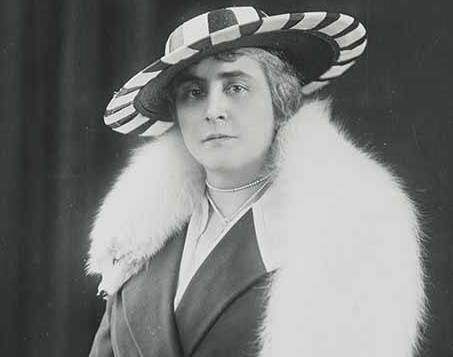 Blacklisted from garment factories for her union activities, she married in 1913 and had three children. Her revolutionary nature didn’t change, however. She rallied for affordable housing and access to education. She was instrumental in organizing the kosher meat boycotts of 1917 and the citywide rent strike of 1919. Even as a senior citizen, Lemlich continued to fight. While she was a resident of the Jewish Home for the Aged in Los Angeles in the 1960s, she helped staff orderlies organize a union. Lemlich died in 1982 when she was 96. At the time, her death went largely unnoticed. 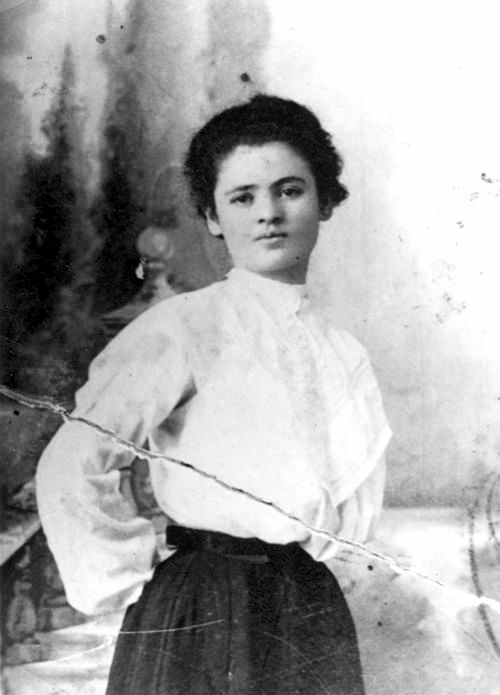 But a push to recognize activists like Lemlich has brought her new attention—as one of the farbrente Yidishe meydlekh (fiery Jewish girls) who led the battle for better working conditions, according to the Jewish Women’s Archive. Take away the el tracks and the rickety carts, and the Bowery looking north from about Grand Street doesn’t look all that different today. The low-rise tenement buildings on the left are still there, now occupied by lighting shops. Cooper Union looms way in the distance. Casperfelds & Cleveland, the jewelers with two signs on the left, are long gone though. 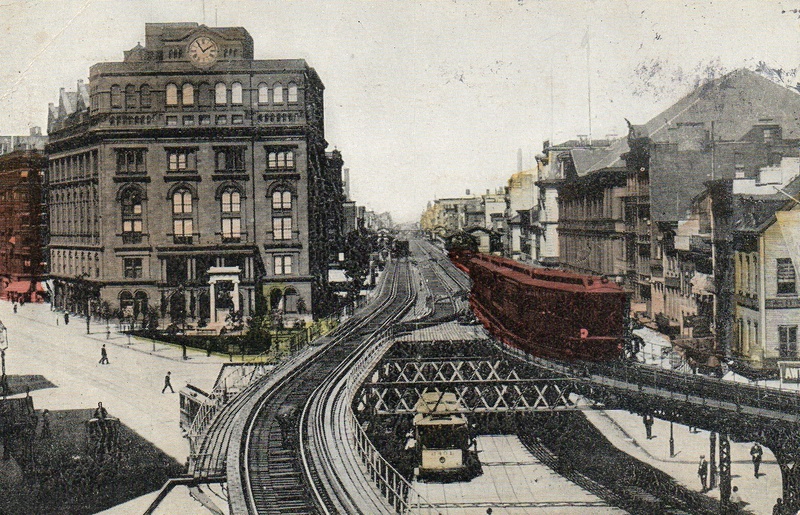 This color postcard shows the rest of the block out of view, with the Bowery Savings Bank anchoring the corner. 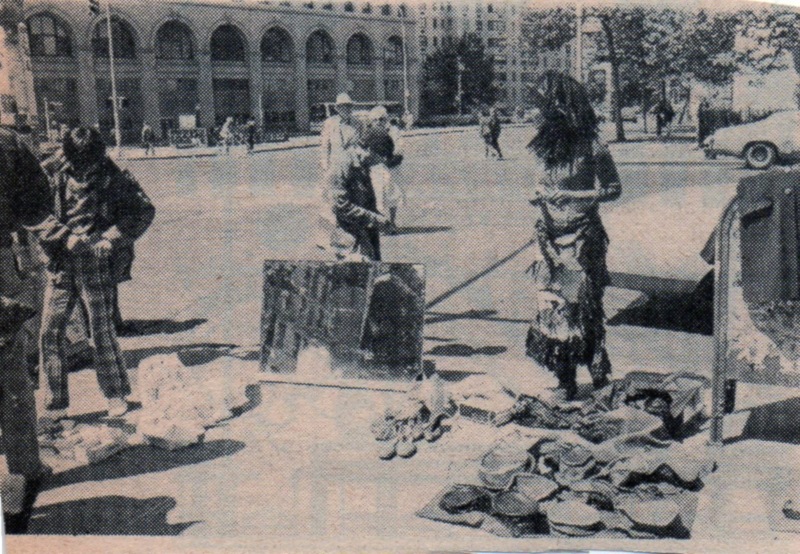 Before the luxe hotels, pretentious condos, and plans for a pedestrian plaza, the Astor Place-Cooper Square area in the 1980s and early 1990s was crammed with peddlers selling anything: books, old clothes, worn shoes, toiletries (I saw a half-empty box of tampons once! ), and other items salvaged from trash. The caption to this photo, from the June 1985 edition of the East Village Eye, takes a sympathetic view toward the peddlers. “Cooper Square street peddlers compete for sidewalk space and cope with the ever-present threat of police sweeps,” it reads. That’s the date on the postmark. 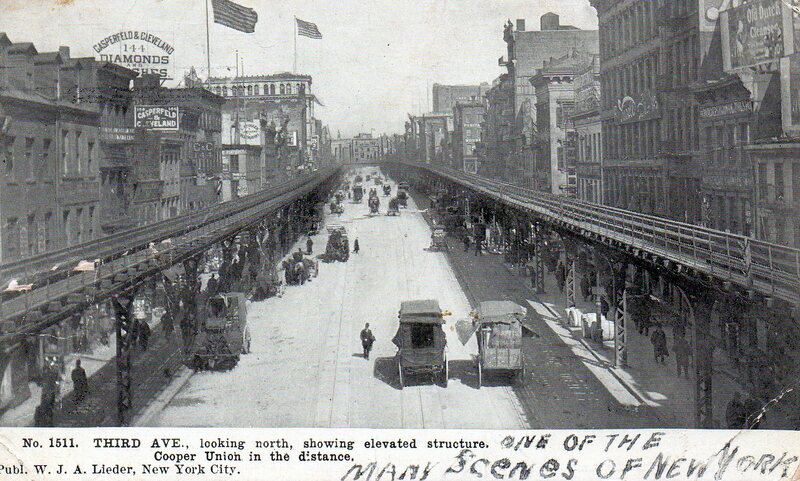 But judging by the fact that there are no cars on the road yet—only horses, wagons, and elevated tracks—I’d say this postcard image was taken earlier. 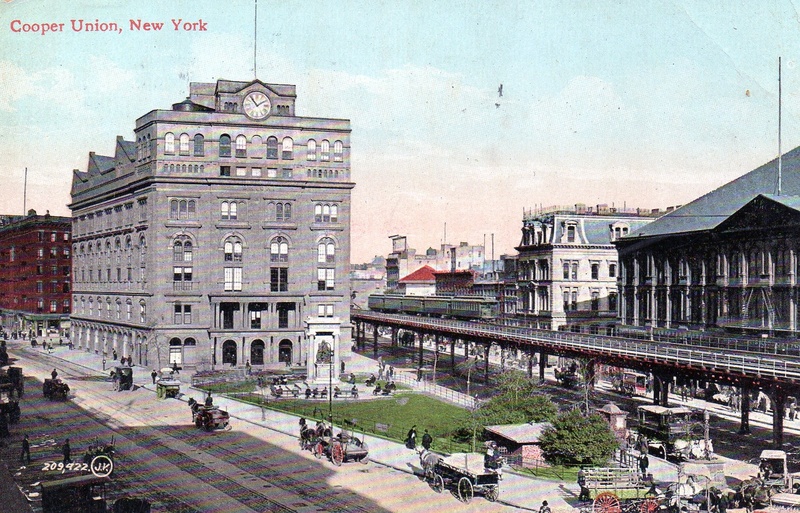 A web of elevated train tracks is flanked by sloped-roof buildings on the right and lovely Cooper Union—described in this postcard as “the Cooper Institute”—on the left. Looks like some really sweet buildings have long since disappeared.